Photoshop can be a tad expensive, so a lot of photographers turn to GIMP, an open source digital image editor with many of the same features. A common trick of digital editing is Selective Colorization. That is where you have a single color in an otherwise black and white photo. Here is a straightforward tutorial on how to do that in GIMP. Here is an example. Note the red on the belt. Here is another example and two more. 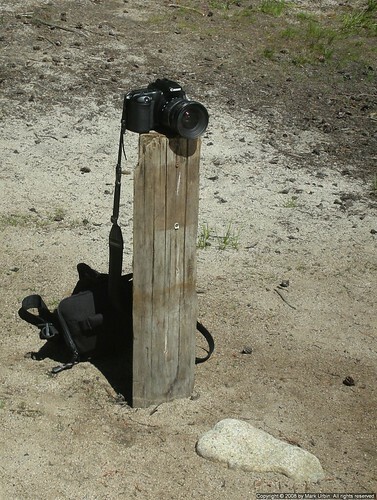 Improvised monopod, originally uploaded by Eclipse Pics (∆ncient). I had a mini tripod with me, but this post actually was a bit higher and was in a perfect spot to catch the better half and I with some great Yosemite High Country views in the background. I’m a voracious reader, and have devoured my share of photography books. Here are some of the ones I enjoyed/found useful. The Adobe Photoshop Lightroom book for digital photographers. Shooting weddings is all about the bride. Ya, you have to get the other relatives, including the groom, in some of the shots, but the focus is on the bride. It’s her day and she is the primary buyer. There was a wedding going on at a hotel just outside Yosemite National Park I was at and I watched the wedding photographer photograph the bride and bridesmaids. He did a fantastic job of fussing over the bride. A very extensive set of shots of her, the bride maids, flower girls and the bride’s parents. He spent about half the amount of time shooting the groom and the grooms men. Those were were good shots, but they were not nearly as extensive. Mark Urbin’s work has been in print for both commercial and non-profit organizations, including Cancer Care Manitoba and Schmap Guides. While most of his work has been nature landscapes, he does sports photography (primarly Martial Arts), home based portrait work and events. Mark is also a practicing 5th degree Black Belt in Shaolin Kempo Karate and has been teaching that art in Westborough, Massachusetts for over a decade. Samples of his work can also be found at Urbinphotography.com and Flickr. His first photography book is of Yosemite National Park.